Mitchell, Kirk. 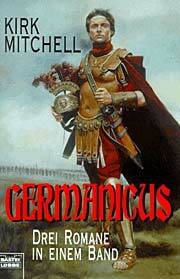 Germanicus . Bastei-Lübbe 1998. What if: Arminius was defeated by Varus in the Teutoburger Wald, and Germany became a Roman province. Twenty years later, Pilate spared Joshua Bar Joseph from crucifixion. The two events resulted in Rome able to withstand Gothic invasions and less likely to split into east and west empires. 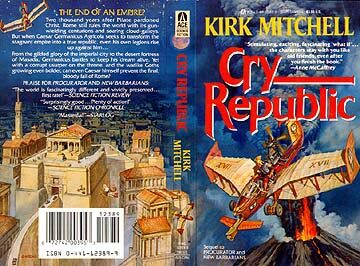 Series note: Series of Procurator , New Barbarians , and Cry Republic . Publication note: Also known as the Germanicus Trilogy. Translation: German of the three books in one volume by Peter Robert and Heike Langhans as Germanicus , Bastei-Lübbe 1998 (3404232046). Mitchell, Kirk. Procurator . Ace 1984. Summary: In 2739 AUC (1986 CE), a plot is afoot to overthrow the Roman Emperor Fabius. The treachery extends all the way to the province of Anatolia, where the governing procurator Germanicus is faced with rebellion and treachery. 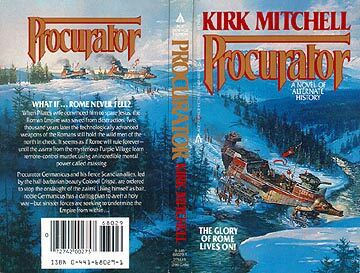 Series note: First in the Procurator Trilogy. Published: Ace 1984, 2000 (0441680291BUY). Translation: German by Peter Robert and Heike Langhans as Procurator . — Included in Germanicus , Bastei-Lübbe 1998 (3404232046). Mitchell, Kirk. 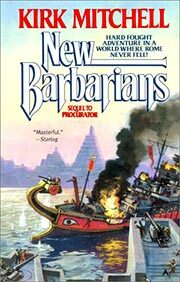 New Barbarians . Ace 1986. Summary: The new emperor Germanicus travels across the Atlantic to command the defense of the new Roman provinces against an Aztec invasion. Eventually he must strike at Tenochtitlan itself, while contending with treachery among his own forces. Series note: Second in the Procurator Trilogy. Published: Ace 1986, 2000 (0441571018BUY). Translation: German by Peter Robert and Heike Langhans as Imperator . Mitchell, Kirk. Cry Republic . Ace 1989. Summary: His plans to restore the Roman Republic after 2000 years having become apparent, the emperor Germanicus is toppled. As he wanders in the eastern regions of the empire, a king arises in the Teutoburger Wald to lead the Germans in rebellion. Series note: Third in the Procurator Trilogy. Published: Ace 1989, 2000 (0441123899BUY). Translation: German by Peter Robert and Heike Langhans as Liberator .